The average life expectancy in the US was 47 years. The maximum speed limit in most cities was 10 mph. Only 14% of the homes in the US had a bathtub. Only 8%of the homes had a telephone. A three-minute call from Denver to New York City cost $11.00 There was no Mother's Day or Father's Day. The tallest structure in the world was the Eiffel Tower. The population of Las Vegas, Nevada, was 30! The average wage in the US was 22 cents an hour. The average US worker made $200 and $400 per year. A competent accountant could expect to earn $2000 per year, a dentist $2,500 per year. A veterinarian between $1,500 and $4,000 per year. A mechanical engineer about $5,000 per year. Ninety % of all US physicians had no college education. Instead, they attended medical schools, many of which were condemned in the press and by the government as "substandard." Two of 10 US adults couldn't read or write. Only 6 % of all Americans had graduated high school. And I can forward this from someone else without typing it myself, and send it to you in a matter of seconds! Try to imagine what it may be like in another 100 years ... it staggers the mind. In preparation for the upcoming weekend trip to Ras Al Khaima on February 9 - 11, our own Brien Holmes gave a presentation on Tuesday, January 11, on RAK based on previous trips there. It was a great preview. I will write more on the trip in the February newsletter, complete with pictures. 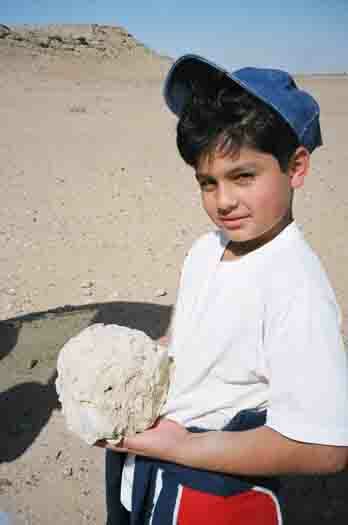 For now, you can go to http://www.enhg.org/gallery/rak/raktrip.htm for images from past trips. This was followed up on Wednesday January 19th, with a reccy trip to ensure access to all the sites on the agenda. Four members left Al Ain at 6:30 am, traveled to RAK, and visited about 10 sites before returning at 10:30 pm. The drive there is about 2.5 hours. This will be an interesting trip, no doubt. One site is now inaccessible due to construction of highway fencing. Luckily another “Tell” is available for viewing and we may stop there. Sheba’s Palace will be added to the list of sites as it permits an excellent view of about a dozen Wadi Suq period tombs as well as a grand view of RAK. The Dhow yards (there are two sites close together, one for small racing dhows and the other for full-size dhow construction) are in full operation, with three or four small dhows either in for repairs or under construction, and a full size “boom” or over-sized dhow under construction at the other site. There is a possibility that the local Cultural Center may have an evening performance on Wednesday or Thursday evening. 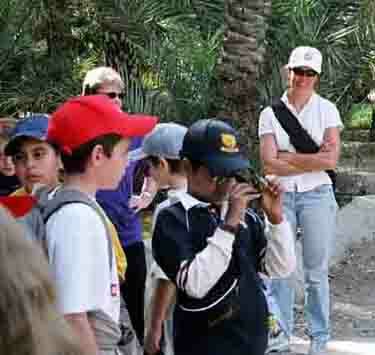 One of Thursday’s highlights will be a visit to Al Hamra, the first city built with oil money. This is an extraordinary “modern history” experience. 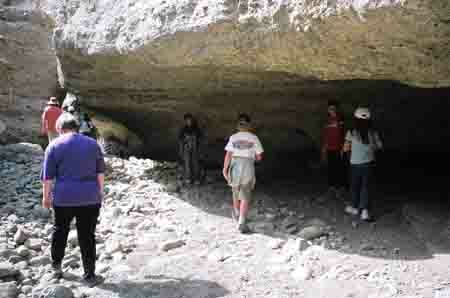 Wadi Sili village’s incredible rockwork is worth the visit all by itself, never mind the yanz site across the valley. Both of these sites are still visited regularly by locals. Some doors are still locked and so we ask that you respect the privacy of these sites. We had a lovely rain come down while we were there, so bring lots of clothes as rain (and even snow!) are possible. Remember that hotel arrangements are your own responsibility. Don’t forget your cameras! 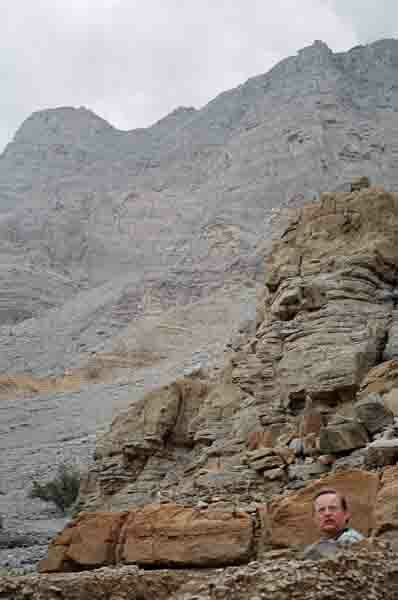 The Ras Al Khaima mountains are impressive. Obviously one could lose oneself in them. Wednesday afternoon – make your way to RAK, check in at your hotel. On Monday and Tuesday, January 17 & 18, three ENHG members accompanied the AAESS fifth formers – all 40+ of them – together with several teachers and parents, to several local sites of interest. The slopes of Fossil Valley have never seen so many young “archies” scouring their nooks and crannies. Many fine samples were found and identified. Gecko nesting sites were located, small mammal burrows, bird, lizard and mammal tracks were identified and a great time was had by all. Right – Treasures are everywhere. This large stone with a small crystal embedded in it has found a friend. We moved on to Jimi oasis where the ancient technique of building with mud-bricks has been used to reconstruct several homes and structures in the oasis. This was the official lunch-stop, so everyone took some quiet time. After lunch, a short talk about the history of the site was given, how the people lived here and how they built their homes of mud. Parrots and bee-eaters added to the excitement. The students clambered over this two-storey building which is narrower at the top than at the bottom, normal for these old buildings, but unlike today’s solid rectangular buildings. The brick factory is right on-site, and the students were suitably impressed with the system of manufacture. The mud-bricks are still evident in the building as the final layer of mud and straw (sarooj) has not yet been applied. Even the students noticed how much cooler it was inside the house than out. 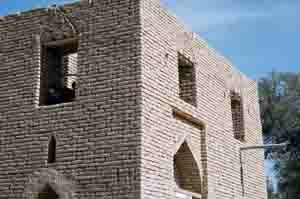 A mud-brick two-storey building in Jimi oasis. 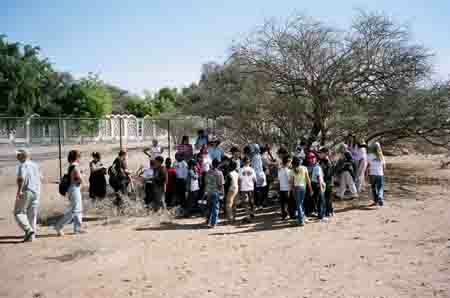 The next, and final stop for the day was the Hili Archeological Park where the students viewed the tombs at Hili 8. 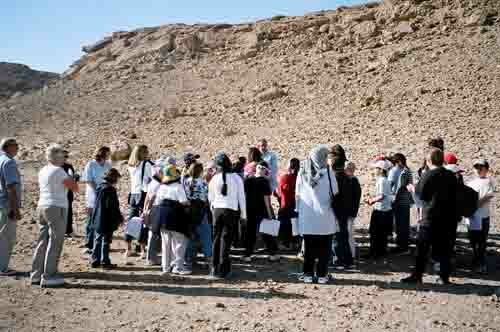 Here, as this is an active archeological site, the students were careful not to disturb anything. They were able to look into the grand tomb and see the difference between reconstructed stone-work and natural 5000 year old work. It was a VERY BUSY day. And so we returned to the school just after 4:00.
were able to use an Abney leveling instrument to check the slope of the water troughs. 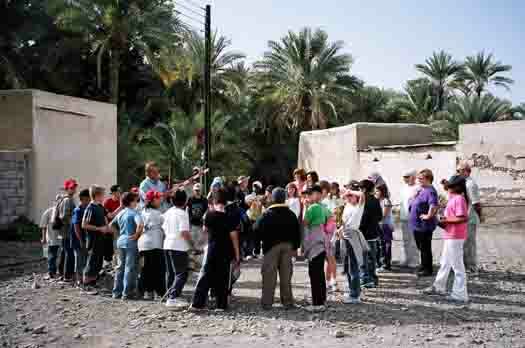 The students learn about the sun-clock, shadows and how water was allocated in Khutwa village. The students took turns examining the Abney level, a more modern inst-rument, for calculating the slope of the land. The second tour took the students to the old village where electricity (and thus a/c) was unknown. They examined the old stone “homes,” and imagined living there. Next was the ancient copper smelting site where hand-prints from thousands of years ago have been preserved in the mud bricks they covered the kiln with. “How did it work?” “Where did they get the copper?” “Who were the people that did this?” All sorts of excellent questions were posed and discussed. To date, no actual copper ore source has been found. 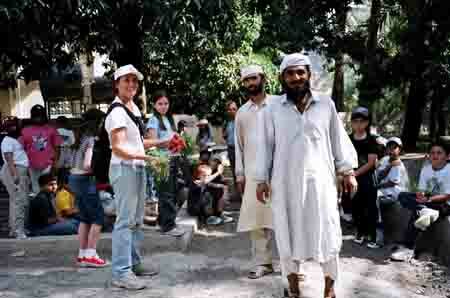 These two tours were followed by a lunch break in the shade of the old mango trees at the center of the village. The students were careful not to litter and impressed the ENHG members with their conscientiousness (spell that without looking if you can!). Then came the best part of all. Two men from the village came and offered us a bunch of fresh radishes and another bunch of fresh greens known as “rocket.” We thanked them and shared this delicious food among ourselves. The entire group then trekked across the gorge (at least 50m deep) out onto an old terraced area and down into the gorge. Great care was exercised as the students scrambled amongst the boulders and sheer conglomerate rock faces. Water scoured caverns and hidden places filled the afternoon with ahhhs and ooohhs. (Principal, AAESS) with several books on local natural history. Thankfully no one was injured beyond a scrape or two and the students were able to appreciate some of the great scenery to be found close to home. Once we were all gathered back at the village, Mr. Holmes presented Ms Brannon with a small collection of books on local natural history topics. We piled into our buses and relaxed for the 50 minute journey back to school where anxious parents waited to collect their children and begin a well-deserved five-day holiday. I want to say what a pleasure it was to accompany this group of well-behaved, polite, curious young people. 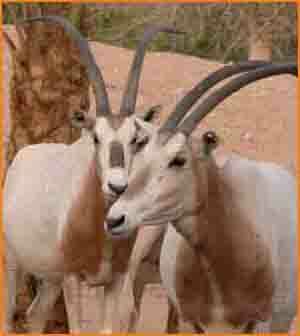 I look forward to the day they will join the Emirates Natural History Group as individuals. I also look forward to doing this again, with other groups from the school. They are obviously ready to benefit from the experience. Take a bow, young people! We set off early to reach Bab Al-Yemen. My friend a Sri Lankan Muslim in Western clothing, myself a non-Muslim Canadian in full hijjab are pointed to a bright yellow taxi. Our driver turns to grin at us very impressed with himself at the reported age of 16 – I’m thinking more like 13 – as the owner and – gasp! – driver of this jazzed up car. Qu’ranic verses printed on a CD disc hang on the rear view mirror while plush red “I love you Sweetie” pillows adorned with frills cushion us in the back seat. A 30’s style Charleston woman is decaled in red on the inside of each window while a golden tasseled plush dash cover traps dust and yellows in the sun. This not only requires a photo, as our driver happily obliges us by letting go of the steering wheel to properly pose, but also deserves the opening of the top flap of my burqa to clearly see if the comedic value is warranted. It is. And the sunlight is much brighter than it appears. 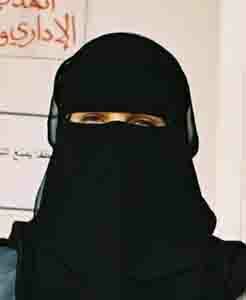 I chose to wear the burqa because I saw no women without it and I did not want to stand out in any way. 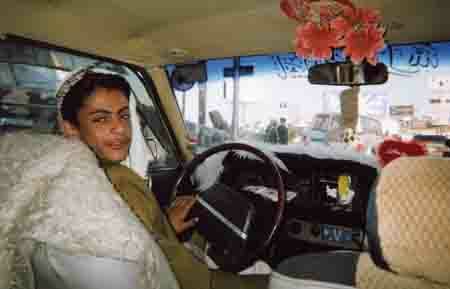 But most of all, I wanted to be afforded the same respect and treatment Yemeni women received. I suppose that also meant I’d signed up for sweating all day, having trouble breathing and getting very, very flat hair. 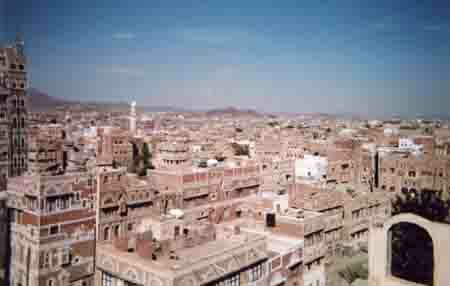 but old Sana’a is for the Yemenis and instead visitors are watched like bears in a cage. The feeling is pleasant and ranges from the least frequent response of indifference to Salaam Aleuykum, Eid Mubarak!, Keif Halekum and please won’t you meet my family, father, grandfather, son? Old Sana’a is a World Heritage site protected by UNESCO and is the largest completely preserved medina in the Arab World. Short and narrow carved wooden doors seem to hold up six to seven story tower houses made of mud and brick and baked as hard as clay over the centuries. Large families live in these separated by different floors for privacy but congregating on common floors to eat and socialize. Homes, shops and restaurants are flush with the streets already crowded with Eid revelers and the toots of slow moving cars forcing medina dwellers onto a narrow or non-existent sidewalk. As I walk behind my friend, cars creep by and gentle hands offer us raisins and coins. We feel like intruders on a very special day yet are somehow brought into the fold seamlessly and with the grandest smiles and with a deep appreciation of our efforts. We take a break in the only open restaurant we’ve seen and only men are seated inside. Unsure of the protocol, we ask permission for me to enter only to be greeted with Of course!, Come in and Eid Mubarak! Warm, folded, Yemeni bread (about the size and thickness of a closed newspaper) is brought over with a metal dish of hot eggs and two cups of steaming and (very!!) sugared tea. I could almost taste the cool air on my face but decide to do like other burqa wearing women and eat with my fingers lifting the veil enough to put food in my mouth without showing my face. It works well except that I drop some egg in the folds of my sheil’a and can smell breakfast all day. We continue to walk on in this old city noticing the friendliness of people, the laughter of children, the care of the elderly family members flanked by younger boys as protection and these silver jambiyyas reflecting and glistening in the sunlight. I open the top flap again once we are on a bridge and look out over the city view of mud houses, mosque minarets, mountains and clean air and sky. Things have not changed here and peacefulness wafts everywhere. For a Westerner, even one behind a burqa, that is a breath of fresh air. The wheels of recycling run slow but sure. Due to other major commitments the recycling sign has been held up again, but should be ready before Feb. 10. We have already filled the paper bin once and anticipate an official opening ceremony in February – sometime. Thank you for your patience. As soon as everything is in place, we will send out notices. All paper and metal (cans) are acceptable. Sorry, no glass or plastic yet. 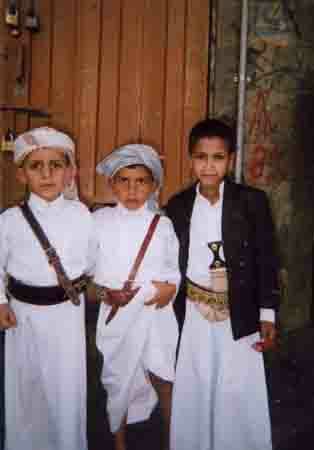 Eid dress for boys is important in Yemen. The committee has decided to have the second trip to Ibri / Nizwa on the weekend of March 31 – April 1 (no – this is not an early April fool’s joke!). The plan is to spend Wednesday evening in Ibri and to have one group go to the Al Ayn Necropolis site (and possibly on to Sent) then on to Tabrin, Bahla, wadi Gul, and Talath. 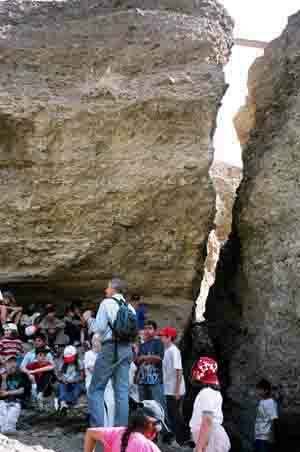 If enough interest is shown (by email) then a second group will go up Jebel Shams and do the cliff walk. This could take place either on Thursday or Friday, depending on what people want. Thursday evening the group(s) will meet up in Nizwa and on Friday the plan is to go to the Nizwa souq, Mannah, Misfa and Al Hamra before returning to Al Ain late in the day. Please contact Will at dreigo@eim.ae to confirm for the trip & to indicate your interests. 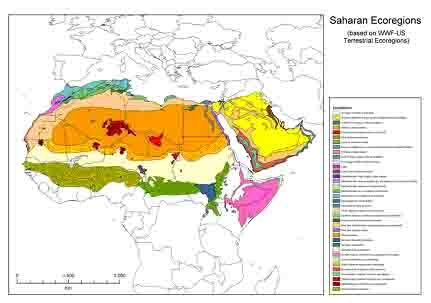 The Sahara, its diverse wildlife and major habitats. We are indeed lucky, here in Al Ain, so far from it all, yet able to attend presentations put on by such highly experienced people as Mr. John Newby who after some eight years in Chad as a volunteer wildlife biologist, established an 80,000 km² Aïr and Ténéré National Nature Reserve and World Heritage Site in Niger. In1991 John was head of WWF International’s Africa & Madagascar Programme, and in 1998 WWF’s Endangered Species Programme. After 28 years with WWF he accepted a job with ERWDA, in Abu Dhabi, in 2002 to head up the Terrestrial Environment Research Centre. John has published widely and was decorated on two occasions by governments in Niger for services to nature conservation. He has been made an Officer in the Order of the Golden Ark by HH Prince Bernhard of the Netherlands. He believes, as did G. W. Murray, a British Surveyor working in Egypt, that “a day spent out of the desert is a day wasted”. His presentation on Tuesday, January 25th, at the Intercon Hotel here in Al Ain was well received by a crowd of about 50. I think it was the width and depth of the presentation that impressed me the most. He began with overviews and worked right down to the individual species, environments and details of interest. 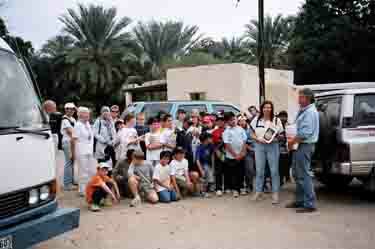 His point about how the pressures almost never go away - even when wildlife has been threatened with near extinction, rehabilitation projects have been initiated complete with public awareness programs, and then reintroduction to the wild has taken place – as with the Omani oryx – even then, people forget and within a few short years the rehabilitated wildlife is under threat anew, if not extinct – this was the most telling point of the evening. How can we overcome the short term memories of people who should know better? He spoke of rainfall and plants and the forces that cause changes in their distribution. Rainfall, of course is still beyond our control, but reducing pressures on plants, such as grazing or harvesting forests, is within our control. Broader reforestation and replanting programs are needed. It is a massive task. But one step at a time does the deed. John’s message needs to be heard across the land and water. For the members of the Emirates Natural History Group, I would like to thank him for sharing his insights and his knowledge of this region. I only hope that governments make more funds available to him to continue his good work. the 5th Annual Al Ain Classical Music Festival is set for March 2nd, 3rd, & 4th. Watch advance notice at the Intercon Hotel. As you know, the ENHG holds its bi-monthly meetings at the Intercon, and we have conducted local tours for their guests for this event (and others) for the past two or three years by way of saying thank you. So if you want to get involved and help support this event, volunteer to lead a couple of groups to a place you know of that is of interest to natural history types. to Subaitha ( Jan. 7th) - What has Subaitha got to offer? A spectacular gorge. A lovely oasis. A largely abandoned village with mud brick houses and a watch tower. A falaj which hugs the cliff-face and ends at deep pools which may be swimmable. Some copper smelting sites. Fruit trees in the oasis, wild flowers in the wadi. Insects, birds, geckos, toads, wadi fish, often a donkey. Spectacular photo-opportunities. A report on one of last year's trips may be found at http://www.enhg.org/gallery/subaitna/subait.htm. to Jebeeb (Jan. 14th), looking for more artefacts before the new developments bury them, a few pieces were found, but not that hoped-for ancient gold coin, etc. to the desert between Abu Dhabi and Al Ain, looking for the old camel caravan stopovers (Jan. 21st) - Years ago, camel caravans traveled routinely from Al Ain to Abu Dhabi, the trip taking up to eight days. Caravans would stop at wells along the route and at other locations. Some small communities are now established where these wells were located, as is the case on the Al Ain – Dubai highway. As a result, all traces of the caravan stops have been lost under new development. One of the sites was known among members of the Abu Dhabi chapter as Site One, a spot on the north side of the Al Ain – Abu Dhabi highway about 33 km from the Mafraq bridge. Site One now appears to be lost owing to farm development. – sadly, no sign was found of any caravan sites. And to the two abandoned villages back of Khutwa (Jan. 28th), these are very interesting sites. What with the winter rains, the terraces were all green with small plants. There was an opportunity to swim and really enjoy nature as well. There is a write up on these sites in the September 2004 newsletter. Following web sites will give you a good background on the scientific names for what is known as Oud or Agar Wood. They are followed by a reference for Sandalwood, a different species produced by an entirely different plant type. Agarwood is produced in a large forest tree and Sandalwood is a scrappy small tree or large shrub. Agarwood contains a resin that is produced by the tree's defence system when attacked by certain fungi. Only small parts of the tree will be so affected and carry the resin, hence the scarcity and high price of Agarwood. Sandalwood, on the other hand, offers all its wood but it is slow growing, relatively rare and similarly expensive. A THIRD WAY TO MUSCAT? For those who are bored with the usual two routes south to Muscat (the Nizwa road & the coast road), there has always been an exciting alternative. We hope to bring you more details of this new route in next month’s issue.